International Drive, also known as 'I-Drive', is a about 10 mile (16km) long road in the southwest part of Orlando and it's main tourist strip. It can be a little bit compared to the Las Vegas Strip. Actually International Drive is even longer than 10 miles, if you also count the more southern part to the busy part where the tourists reside. The busier parts starts at the south end at SeaWorld, Discovery Cove and Aquatica. The north end ends at the Artegon Marketplace and the Orlando International Premium Outlets. 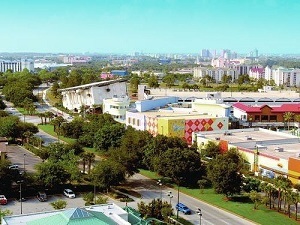 Along International Drive you can find a lot of major hotels, shops, restaurants and entertainment. The Orange County Convention Center complex can also be found there, The OCCC complex is the 2nd largest convention center in the nation. Universal Orlando is close by and can be reached easily by car, taxi, bus and even by foot! The busiest part is probably between> W Sand Lake Rd and Universal Blvd, but that's my personal opinion. Using the I-Ride Trolley Service is a convenient way to get around on I-Drive, whether you have a (rental) car or not. It drives up and down I-Drive and even passes Universal Orlando. Excellent for tourists without a drivers license. The I-Ride trolley operates from 8AM-10.30PM and costs $2.00 per ride, kids ride for $1.00 (age 3-9, with paying adult). You can even buy unlimited ride passes, starting from $5 a day to $18 for 14 days. More information about the fares can be found on the I-Trolley website. If you are going to spend some time near International Drive, you might want to see these things (besides the theme parks); Wonderworks, Ripley's Believe it or Not, Pointe Orlando, one of the mini golf courses, Fun Spot, Titanic Experience, Air Florida Helicopter and last but not least the latest new entertainment experience: I-Drive 360. I Drive 360 is the latest entertainment destination on International Drive. Constructions started in 2013, finishing in 2015 with the Orlando Eye as centerpiece of the complex. A 400 foot ferris wheel giving you a perfect 360 degrees view or Orlando's surroundings. At I-Drive 360 there is fine dining at multiple restaurants, attractions like the Orlando Eye but also a Madame Tussaud's, SeaLife Aquarium and Arcade City. For Night Life entertainment there is Tin Roof and Cowgirls Rockbar. Also for shoppers much to see and buy. Take a look at the I-Drive 360 website for the latest information. Information about International Drive itself can be found over here.